Description Check out my first weird game: GSi Live- The SEQUEL! It's the sequel to the first game I ever made on Petit Computer. (Never released it to the public, though) It's a weird trivia game show with a weird host, and features: -*FIFTEEN*(!!!) Different tricky trivia questions! -Fast paced actions! -A prize worth money! -And so much etc. it's hard to over exaggerate it all! Link to Miiverse post: https://miiverse.nintendo.net/posts/AYMHAAACAAADVHkiybLDuw Instructions When you start the game you have $1000000, but once your questions come up you quickly start losing money! 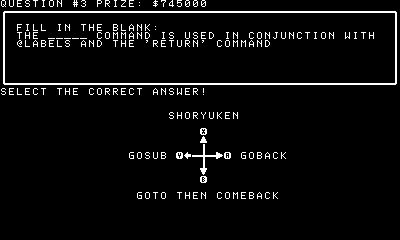 Answer the three obscure trivia questions using either the d-pad or the ABXY buttons, then you get the results and see whether you got each question right or wrong. Each correct answer adds $250000 to your prize, and each incorrect answer removes $250000 from your prize! You win if you end with any value above zero, and lose if you end up with any value below zero.